An elevator convo with Kalo. See here for more from our Next Up series. I am a calligrapher and stationery designer. I specialize in western dip ink calligraphy as well as bespoke invitation designs under the brand Kalo Make Art. The studio hosts a range of creative events, such as calligraphy workshops, jamming practice evenings and monthly pen meets which welcome attendees from all walks of life. My studio also sells a range of calligraphy tools — penholders, brushes, nibs, inks, papers, cards as well as many other stationery. I have always been passionate about art and design. I spent most my life making artworks. At university, I studied fine art history and painting for my degree. In 2011, I established Kalo Make Art in order to become a full-time designer and calligrapher. In June 2015, I opened Hong Kong’s first calligraphy studio in Central with the aim to create a cozy and relaxing environment for students to learn and enjoy the art of western calligraphy. I truly love what I do every day! My job covers a wide range of projects, from running calligraphy workshops for younger students and adults to writing at events for corporate clients and designing stationery for wedding couples. My working life varies every day. There is no “standard” work pattern. However, I now dedicate most of my time to teaching workshops and hosting calligraphy events, as my ambition and direction at Kalo Make Art is to promote western calligraphy and to inspire and educate others in this beautiful art form. 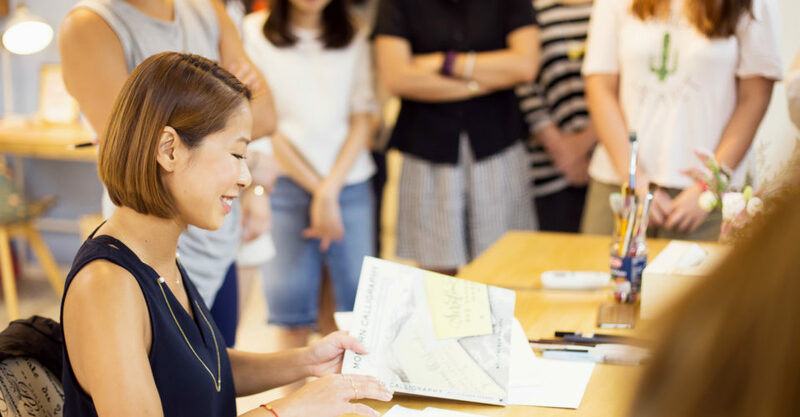 After fours years of calligraphy teaching, I saw that the demand for creative learning and calligraphy supplies has grown dramatically in Hong Kong. This year , Kalo Make Art has broadened workshop subjects to cope. I am now teaching dip pen calligraphy and brush pen calligraphy as well as watercolour painting. Additionally, I have expanded the shop supplies at the studio, and customers can also now purchase calligraphy supplies through my online shop.